We have been doing our best to preserve some of the garden bounty for enjoyment during the cold winter months here in Minnesota. The flavors of garden green beans and sweet corn in the depths of winter just cannot be beat. I must admit, however, that in the last few summers I have went a little crazy with freezing. In particular, I was obsessed with harvesting and trying to freeze as many green beans as possible so that none would go to waste. The result was a lot of wasted effort. We never managed to consume all the beans and each season’s leftovers ended up on the bottom of the freezer when I covered them with the newest harvest. I finally decided to clean out all the leftovers this summer, thaw them out, and throw them on the compost pile. Time for a fresh start and a more realistic amount of freezing this year. Over a two-week period in July, we harvested our green beans and froze around 20 quart-size bags. I do my best to estimate the serving size for our family, and pack the bags accordingly. After blanching the beans in boiling water and cooling them off in ice water, we pack them into Ziploc freezer bags and squeeze out as much air as possible before placing them in the freezer. Last year, for the first time, we also froze some sweet corn for winter consumption. Not surprisingly, when given the choice, the kids preferred the corn over the green beans. 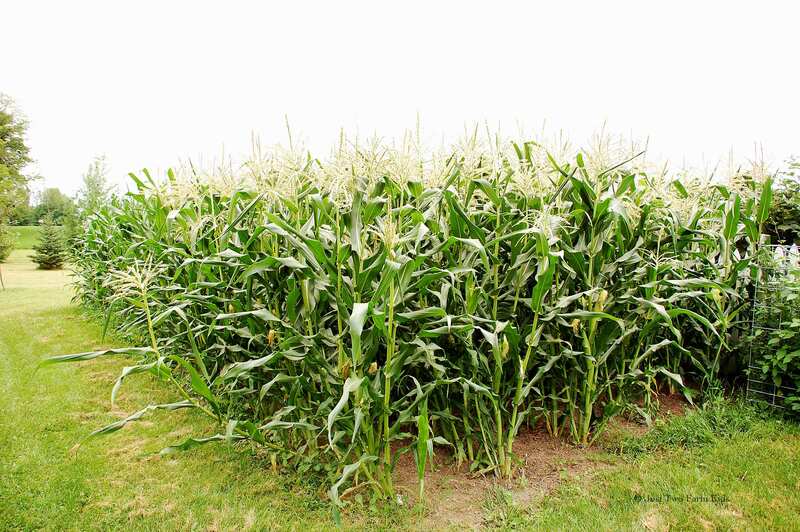 We planted our own sweet corn this year, increasing our patch to at least two times the size. Even with the larger sized patch, we did not have enough of our own for freezing. We were too busy picking it and eating it fresh as it ripened! Instead, like last year, we went out and purchased some from a neighbor at a road-side stand. We bought 8 dozen at $3.00 each. The corn was perfectly ripe and freshly picked that morning out of the field. 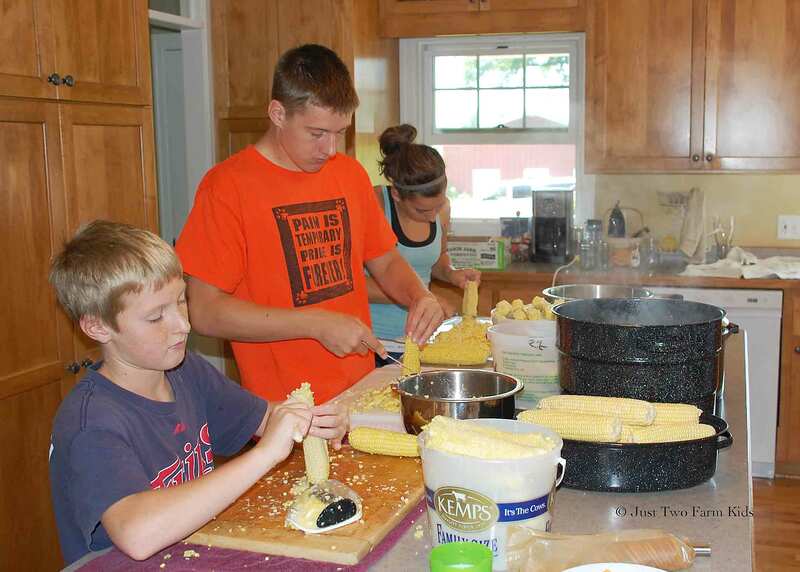 The kids helped with the process: peeling the ears, cutting off the kernels (after blanching the cobs in boiling water), and putting the corn in the freezer bags. Freezing corn is a very sticky and messy process. The worst part is the clean-up, which I usually end up doing on my own. We ended up with a total of 20 bags of frozen corn, with about 4 cups in each bag (approximately $1.20/bag). Although it might be cheaper and far less work to just buy frozen corn at the grocery store this winter, I know from our past experiences that we will all enjoy this corn much more. Not only is the flavor far superior, but there is definitely satisfaction that comes with knowing exactly where your food came from and that you participated in its preservation. Often times in the past, pulling bags of our veggies from the freezer for a meal starts conversations about the summer, the harvesting, or the preserving. Veggies from the frozen food aisle certainly do not have the same effect! My hope is that the kids will carry these experiences into their adult life and consider gardening, or that they will at least occasionally consider the source of their food. So, once again we are headed into winter with our own frozen veggies in the freezer. Hopefully, the 40 bags will be just the right amount! Thanks to the ranting and raving of various people, I have discovered a great new way to use all of those green beans and wax beans that I am harvesting at the moment. Over the past few years, when discussing preserving the garden harvest I have heard numerous people mention dilly beans and how much they love them. I must admit, the thought of pickled beans did not sound that good to me at first. At some point, however, I just could not ignore the fact that a LOT of people seemed to like these dilly beans.